Random House Books for Young Readers, 9780385376938, 32pp. In honor of the community of Sandy Hook and Newtown, Random House, the publisher of Snowflakes Fall, has made a donation to the Sandy Hook School Support Fund. Random House is also donating 25,000 new books to the national literacy organization First Book in the community’s honor and in support of children everywhere. 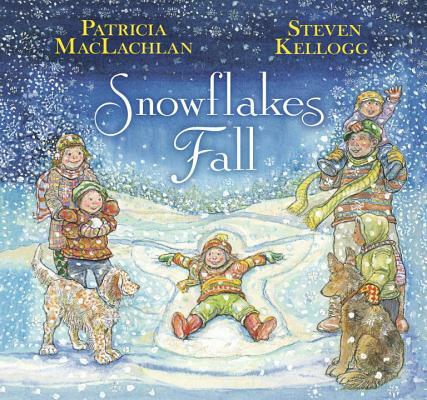 PATRICIA MACLACHLAN is best known for her Newbery Medal-winning novel, Sarah, Plain and Tall. Born in Cheyenne, Wyoming, she attended the University of Connecticut and has written more than a dozen stories for children including Baby and Journey. She now lives in Williamsburg, Massachusetts, with her husband. STEVEN KELLOGG has published over 100 award-winning books for children, among them The Day Jimmy's Boa Ate the Wash, Johnny Appleseed, and the Pinkerton books. He studied illustration at the Rhode Island School of Design where he became intrigued by the picture book format. He lived in Sandy Hook, Connecticut, for 35 years with his family, where he was an active member of the community. He now lives in Essex, New York, with his wife. "Adults can share this book to address tragic events, discuss grief and the recovery process, and remind children of the precious beauty of life." "This is a graceful homage to the inevitable seasons of life and remembrances of loved ones and times past. Whether or not they are familiar with loss and grief, children will feel the healing power of this hopeful, uplifting book."